The classical Garden à la Française evolved from the French Renaissance garden, a style which was inspired by the earlier Italian Renaissance garden at the beginning of the 16th Century. The Italian Renaissance garden was typified by planting beds or parterres. The French Formal Garden is a style of garden based on symmetry and the principle of imposing order on nature. Its epitome is generally considered to be the Gardens of Versailles designed during the 17th Century by the landscape architect André Le Nôtre for Louis XIV and replicated by other European courts. This handmade Authentic Provence planter is an exact re-edition of the French planter from the 17th Century as seen throughout the Gardens at the Château de Versailles. Solely, the Caisse de Versailles has the function to open the four wood panels in order to easily extract the citrus trees, or care for their roots. The plants were then and still are stored in the Orangeries of Versailles during the winter season. These French Jardinières are made of the finest combination of teak wood combined with an aluminum structure. The bottom is completed with an aluminum grill, which allows the sod to be drained and aerated. 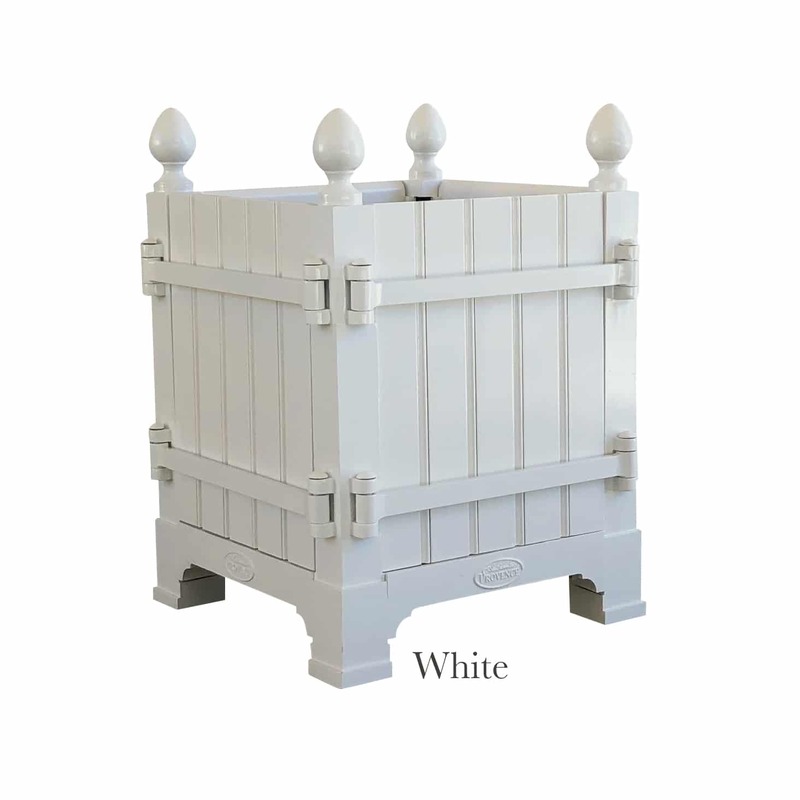 This historical garden planter is implemented worldwide in the most magnificent gardens. Authentic Provence® has improved this classic planter by keeping all the aspects of the original planter including the removable panels. The panels are made of teak wood, while the metal structure is made of aluminum. The planter is crowned with the typical French pomme de pin finial. A grated interior is included for east drainage as well as for irrigation purposes. Aluminum, teak panels/rust and weather resistant. Featured are Authentic Provence 2018 colors. Custom colors are available based on the Benjamin Moore, Porter Paint or RAL color charts. Authentic Provence® has improved this classic planter by keeping all the aspects of the original planter including the removable panels. The panels are made of teak wood, while the metal structure is made of aluminum. The planter is crowned with the typical French pomme de pin finial. A grated interior is included for east drainage as well as for irrigation purposes. Aluminum, teak panels / rust and weather resistant.